Remember when researchers told us in October 2010 to expect 1Tbps Ethernet by 2015 and 100Tbps by 2020? Well, they weren't just messing around. At the Optical Fiber Communications Conference in Los Angeles last month, two separate research groups have set a world record by sending information at rate of more than 100 terabits of per second (Tbps) through a single optical fiber. That's equivalent to streaming three solid months of HD video, or the contents of 250 double-sided Blu-ray discs, in one second. It's thus not much of a surprise that Ting Wang at NEC Laboratories in Princeton, New Jersey, called the achievement "a critical milestone in fiber capacity," according to New Scientist. 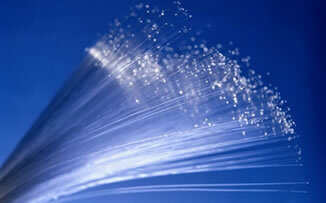 NEC Laboratories America reached 101.7 Tbps over standard single-mode fiber using pilot-based phase noise mitigation. The team sent 370 wavelengths each with data rates of 294 Gbps over 165km of standard single-mode fiber, and claimed it achieved spectral efficiency of 11 bits/s/Hz, the highest reported to date for wavelength-division multiplexing transmission. A separate team from Sumitomo Electric Industries in Japan, demonstrated 109Tbps using spatial division multiplexed signals over a seven-core fiber. The Sumitomo group sent 97 colors through each of the cores at data rates of 172Gbps (two 86Gbps QPSK signals) over 16.8 km of fiber. One of the many problems the technology still needs to overcome is cost. Multi-core fibres are complex to make, as is amplifying signals for long-distance transmission in either technique. That being said, a few technology companies will likely shell out the necessary dough needed to get 100Tbps speeds.